Time For Me: Another busy week! Hi everyone, well so much for my plans to catch up with my visits to your blogs this week, it's not looking too good so far! I haven't even had the chance to enter any challenges, so I thought I'd post the wedding card I made for my lovely niece. She got married last Saturday, so it's safe to show it now. I've been busily making another for my nephew (her brother) who is due to get married on the 30th, so I'll post a picture of it after that date. I've just seen their wedding photos online, they are beautiful and evidently, according to Jane it was the 'perfect day'. I'm so pleased as she's a real sweetie and deserves everything good that comes her way. I promise that I'll get to visit you just as soon as I can, until then thank you for continuing to visit my little haven and for all the lovely messages you leave, they really brighten my day. Gorgeous wedding card Chrissie - don't worry about visiting blogs so much you can't help being busy. What a fabulous card, the image you have chosen is so cute and perfect. I love the flower and centre piece in the corner . The little heart just finishes it off perfectly. What a beautiful card Chrissie - love this Stanglar image! Your Niece will love it! Totally awesome Chrissie love that image am still waiting for them to be released at Funky Kits then I will jump in lol. It makes such a refreshing change to see a 'cutsie' wedding card and I love it. So glad your niece's wedding went OK. I'm sure they loved this card. So different from any shop bought ones they would have got. Beautiful card Chrissie and I'm glad that the wedding went well! There's a little package in the post for you as we speak!! Wow,that's a gorgeous card Chrissie, be sure to show us the one for your nephew. Hi Chrissie I have left a couple of goodies for you on my blog. What a gorgeous card Chrissie, such a beautiful couple. 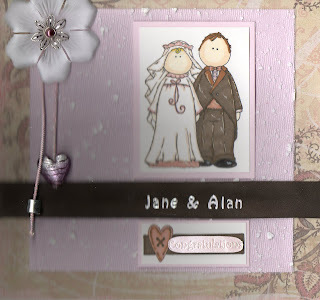 What a gorgeous wedding card Chrissie, beautiful accents and colouring...and a lovely image of course!